I've got some things taking precedence over the blog today (I KNOW. THE NERVE. ), so I just have a minute. And yes, I KNOW I just did this to you on, what? Sunday? Yes. So sorry. When real life or The Bachelor's endless two-hour episodes come calling, you all get shafted. 1. College students can get Amazon Prime Shipping (free two-day shipping) for a year. (You must have a .edu e-mail address.) We have a family Amazon Prime membership and use it all the time; I literally buy almost everything from Amazon because I can have it on my front porch within two days for "free." Click here to sign up for free two-day shipping from Amazon if you're a college student. This has nothing to do with the Amazon Affiliates program, and in fact I e-mailed Amazon customer support personally to be sure this was even a legitimate program before mentioning it to you. I just want everyone to be able to participate if they can ... feel free to let your college-age friends and family know about it. 2. 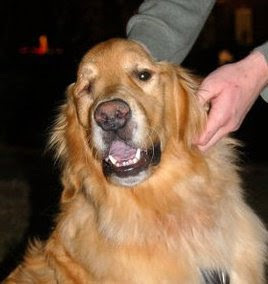 Many of you have asked about my friends Heather and Rob's Golden Retriever Jake, and he is doing really well, all things considered. Thank you so much for caring about them! They met with the physical therapist last week, and she evaluated Jake. She was really encouraged by the progress they've been able to make with him just since he's been home from the animal hospital. They are currently planning to start electrical stimulation and laser therapy to assist with the paralysis. They're even considering water therapy, but that would come much later and is dependent on how things go with the first round of therapy. 3. Remember when I ordered hooks from Pottery Barn for the kitchen and the boys' bathroom? The Grand Plan was that their backpacks and jackets would hang from the ones in the kitchen and their towels would hang from the ones in the bathroom. So I hung the hooks in the kitchen right away, and they've been fine ... except they sort of spin around. This is because I accidentally threw away the anchors. Uh huh. Yesterday I decided to hang the ones in the bathroom with anchors I had in our toolbox. Well. They won't sink flush with the back of the hollow-core door, so the hooks STILL spin, even with the anchors. I had to call Pottery Barn to ask them to send me six anchor-and-nail sets last night. And the point of this loooooooooooong anecdote was simply to tell you that for some people, making that call might have been an inconvenience. But not for me. Because I have Pottery Barn's customer service number programmed into my cell phone. Yes I do. And that, my friends, is when you know you have a serious problem. I got a kick out of that twitter last night when you said you had that number in your phone! Is it bad that I have our MasterCard number memorized? Bob just about dropped his teeth when I rattled it off to the termite guy the other day. I dare Bob to lose this card again! I have to work hard to use it (online) often enough to memorize a new one. Oh my goodness, that amazon student is the best ever! I used it for my textbooks for this semester (don't grad schools know their students are "starving" I could of put a down payment on a car instead!). I may have paid an arm and a leg, but they shipped for free and in 2 days! I think Amazon has a similar program for mothers. I'll have to double check. On a work note, our IT department has started the SCRUM method of project implementation... you familiar with it? Today you are my #1 hero. I wish I knew about the free amazon shipping this summer. Instead I PAID for shipping on $1200 in law school books...totaling about 62 pounds. You've saved me much money for next year!!! Thank you! Beckie, my Visa is memorized, too. Saves so much time! Tamar, so glad you're already saving the money with Prime! Laura, you're right. And all of a sudden, the last eight years of paying for diapers makes it seem like I should have been getting Prime memberships for about a dozen people for free all this time. Beth, oh YES, I know your SCRUM. Amanda, so glad to have helped at least one person! YEA!